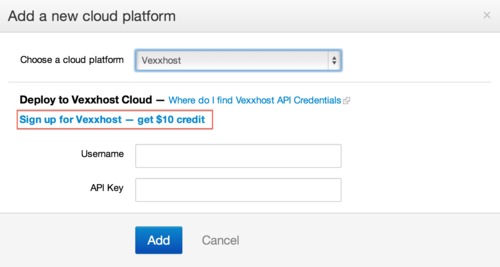 All Cloud 66 customers can get $10 free credit from Vexxhost by just linking their Cloud 66 account to Vexxhost. Vexxhost prices start from $5 per month for a 2 CPU Cores, 512MB Memory and 2TB of transfer. Claim your $10 free credit by selecting Vexxhost from the list and clicking on the “Sign up for Vexxhost - get $10 credit”. You will have to then sign up with Vexxhost. Your new Vexxhost account will be added to your account automatically. No need do anything else. As simple as that!